Plastic 'F' profile for use at the side edges of a corotherm roof. Available to suit 10mm, 16mm and 25mm corotherm multiwall polycarbonate sheets in both white and brown colour options, this accessory provides an aesthetically pleasing finish to the roof edges. Available to suit 10mm,16mm and 25mm Corotherm sheet in either white or brown. This plastic "F" profile is for use at the side edges of a Corotherm roof. 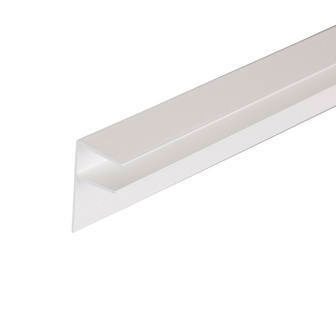 Easily clipped onto the edge of the sheeting and screwed into the support through the overhang, this accessory provides an aesthetically pleasing finish to the roof edges.